On March 10, at 11:55 p.m., a Calcasieu Parish Sheriff’s Office deputy conducted a traffic stop on a car near the intersection of Hwy 171 and Theriot Road in Moss Bluff. 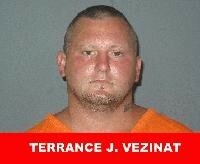 The driver, Terrance J. Vezinat, 30, 1277 Hwy 171N, Lot #85, Lake Charles, was driving carelessly. When the deputy spoke with Vezinat he noticed an open container of beer in the car. Vezinat confirmed to the deputies he had been drinking. He performed poorly on a standard field sobriety test, and a breath intoxilyzer test concluded he was over the legal limit to be operating a motor vehicle. Vezinat, who has 2 prior DWI arrests, was charged with DWI 3rd; careless operation; and open container. He was booked into the Calcasieu Correctional Center. Judge Clayton Davis set Vezinat ’s bond at $11,500 with a special condition that he has to wear an alcohol detecting ankle bracelet at all times. CPSO Cpl. Freddy Galicia was the arresting deputy on this case.